Not all clients are equal. Sure, every client deserves your best work, but it’s important to recognize that not all clients are of equal value to your business. It’s even more important to recognize the clients who are. We know that real estate photographers and iGUIDE® professionals are busy and have very little time to spend with existing clients and also go out and win new ones. Which is why it makes sense to be strategic when developing your real estate photography business by focusing on building your valuable clients. We’ll go through the process for identifying your most valuable potential clients and share tips for learning about your clients’ business and what they value in your services. We’ll look at strategies for retaining your high value clients, and lastly how to get more business from, and through, these valuable clients. There are 1,360,000 registered realtors in the United States and the 2018 National Association of Realtors Member Profile provided an average number of listings per realtor. 17% of realtors only had one listing. 25% had between 2 and 5 listings. 7% had between 6 and 10 listings. 6% of realtors had more than 11 listings. This means that 45% – over 610,000 realtors did not list a single home. Why is this important to know? A professional real estate photography business is about listings. Without listings, you don’t get paid. Your market is real estate and your client pool is made up of realtors, but two-thirds of your potential clients have very little or no value to your business because they don’t list enough homes to sustain your business. It’s important to your success that you begin to look at your pool of potential clients and decide how much effort you’re going to invest on winning their business by looking into their potential value to you. Even more importantly, you want to focus on the small segment of your market, the 6% who represent the most significant opportunities for your business. These are the productive realtors who list more than 11 properties per year. And, when we completed our first financial year in 2014, we broke down our number of iGUIDE sales per Realtor to analyse our strategy. The small group of potential clients we focused our efforts on, became the top 7% of our clients; and they gave us 774 iGUIDEs, close to our goal of 1,000. The other 93% of our clients gave an additional 758 iGUIDEs and contributed to nearly 50% of our total business for the year. We focused our sales and marketing efforts on winning the highly valuable top producing clients, yet look at the amount of additional business we gained. We nearly won all the business we wanted from our high value targets and half of our total business walked in the door with our targets. These other clients saw our work in the marketplace and wanted to do what the top producers were doing. We didn’t need to focus on them, they simply saw our incredible results and came on board. Our success came from focusing on these valuable, high producing clients. The lessons we learned in our first market were applied in every new market we opened and are applied by many successful iGUIDE teams today. As you watch the next videos in this series or read these articles, try to have your client information on hand, so you can work through identifying and understanding your most valuable clients. As a valuable exercise for you, we’ve included a simple Google sheet on our Building Blocks webpage for you to download and work on. Fill in their total dollar value for 2018 and the total number of jobs you did for them. If you shot drone, photos, and an iGUIDE for the same property, count that as a single job. Then, when you’ve entered all your clients, find out your value mix by grouping them into totals as indicated at the top of the worksheet. What does your value mix look like? Is your business driven by the top performers or the smaller producing agents? If spending time on sales and marketing is a challenge, then your goal must be gaining more high performing clients and fewer small, occasional clients. Now you can take this knowledge and apply it to your marketing and sales efforts to be more methodical and efficient with your time. But this is just the start. Stay tuned for future videos in our Focus on Growth series to continue to unlock the crucial strategies for growing your real estate photography business. This is the iGUIDE Client Analysis worksheet. Try using this worksheet to do a client analysis to see who your top clients are. Don’t have the password? 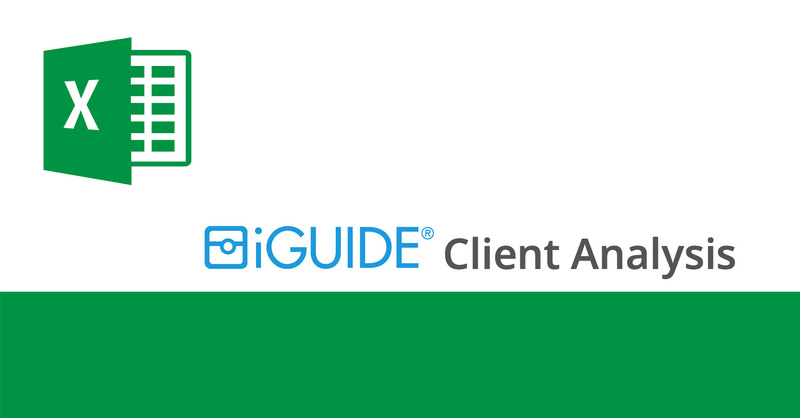 Click here to fill out our iGUIDE Building Blocks form to receive the password to download the iGUIDE Client Analysis worksheet.